Sir Christopher James Wren, (October 20, 1632–February 25, 1723) was a seventeenth century English designer, astronomer, geometer, and the greatest English architect of his time. Wren designed 53 London churches, including St Paul's Cathedral, as well as many secular buildings of note such as Oxford University's Sheldonian Theatre, where convocations are held. He was a founder of the Royal Society (president 1680–1682), and his scientific work was highly regarded by Sir Isaac Newton and Blaise Pascal. Wren left an indelible mark on English architecture and was a major figure of the English Renaissance. As England turned away from Europe as the main stage of her imperial ambition, and looked to territories further afield in the Americas and in Asia, it was fitting that a new capital should be built for a new empire after much of the city had been destroyed in the Great Fire. His epitaph reads, "Si monumentum requiris, circumspice,'," "If you're looking for his legacy, look around." Wren was born at East Knoyle, Wiltshire, on October 20, 1632, the only surviving son of Christopher Wren DD (1589-1658), at that time the rector of East Knoyle and later dean of Windsor. A previous child of Dr Wren, also named Christopher, was born on November 22, 1631, and had died the same day. John Aubrey’s confusion of the two persisted occasionally into late twentieth-century literature. As a child Wren ‘seem’d consumptive’ - the kind of sickly child who survives into robust old age. He was first taught at home by a private tutor and his father. After his father's appointment as dean of Windsor in March 1635, his family spent part of each year there. Little is known about Wren’s life at Windsor and it is misleading to say that Wren and the son of Charles I became childhood friends there and “often played together”. Wren’s schooling is not at all definitive. The story that he was at Westminster School from 1641 to 1646 is unsubstantiated. Parentalia, the biography compiled by his son a third Christopher, places him there ‘for some short time’ before going to Oxford (in [650). Some of his youthful exercises preserved or recorded (though few are datable) showed that he received a thorough grounding in Latin; he also learned to draw. 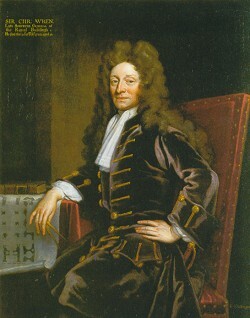 According to Parentalia, he was ‘initiated’ in the principles of mathematics by Dr. William Holder, who married Wren’s elder sister Susan in 1643. During this time period, Wren manifested an interest in the design and construction of mechanical instruments. It was probably through Holder that Wren met Sir Charles Scarburgh, with whom he assisted in the anatomical studies. Wren entered Wadham College, Oxford, on June 25, 1650. At Wadham, Wren’s formal education was conventional. The curriculum was still based on the study of Aristotle and the discipline of the Latin language, and it is anachronistic to imagine that he received scientific training in the modern sense. However, Wren became closely associated with John Wilkins, who served as warden in Wadham. John Wilkins was a member of a group of distinguished scholars. This group, whose activities led to the formation of Royal Society, was consisted of a number of distinguished mathematicians, original and sometimes brilliant practical workers and experimental philosophers. This connection probably influenced Wren’s studies of science and mathematics at college. He graduated B.A. in 1651, and three years later received M.A. In 1662, they proposed a society “for the promotion of Physico-Mathematicall Experimental Learning.” This body received its Royal Charter from Charles II and 'The Royal Society of London for the Promotion of Natural Knowledge' was formed. In addition to being a founder member of the Society, Wren was president of the Royal Society from 1680 to 1682. The main sources for Wren’s scientific achievements are the records of the Royal Society. His scientific works ranged from astronomy, optics, the problem of finding longitude at sea, cosmology, mechanics, microscopy, surveying, medicine and meteorology. He observed, measured, dissected, built models, and employed, invented and improved a variety of instruments. It appears, however, that, having tested himself successfully in so many directions, he still, at 30, had not found the one in which he could find complete satisfaction. It is from around these times, his attention begins to turn to architecture. 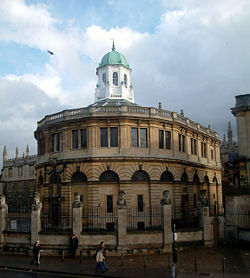 One of Wren’s first architectural endeavors was the designs of the Sheldonian Theatre in Oxford, which was completed in 1662. This, the gift of Bishop Sheldon of London to his old university, was influenced by the classical form of the Theatre of Marcellus in Rome, but was a mixture of this classical design with a modern empirical design. It was probably around this time that Wren was drawn into redesigning a battered Saint Paul’s Cathedral. Making a trip to Paris in 1665, Wren studied the architecture, which had reached a climax of creativity, and perused the drawings of Bernini, the great Italian sculptor and architect. Returning from Paris, he made his first design for Saint Paul’s. 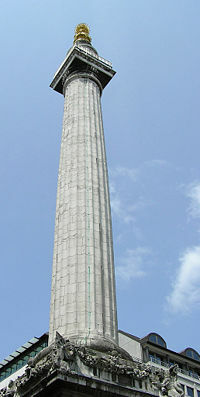 A week later, however, the Great Fire destroyed two-thirds of the city. Wren submitted his plans for rebuilding the city to king Charles II, however, was never adopted. With his appointment as King’s Surveyor of Works in 1669, he had a presence in the general process of rebuilding the city, but was not directly involved with the rebuilding of houses or companies’ halls. Wren was personally responsible of the rebuilding of 51 churches; however, it is not necessarily true to say that each of them represented his own fully developed design. Look below for more information on Saint Paul’s and concurrent projects. Wren was knighted November 24, 1673. He was bestowed after his resignation from the Savilian position in Oxford, by which time he had already begun to make his mark as an architect both in services to the Crown and in playing an important part in rebuilding London after the Great Fire. Wren married Faith Coghill, daughter of Sir John Coghill of Bletchingham, in 1669. Bletchingham was the home of Wren's brother-in-law William Holder who was rector of the local church. Holder had been a Fellow of Pembroke College, Oxford. An intellectual of considerable ability, he is said to have been the figure who introduced Wren to arithmetic and geometry. By 1669 Wren's career was well established and it may have been his appointment as Surveyor-General of the King's Works in early 1669 that persuaded him that he could finally afford to take a wife. Little is known of Faith's life or demeanor, but a charming love letter from Wren survives and it is clear that the young Wren was entirely devoted to her. Faith died of smallpox a few months after giving birth to their second child, in September 1675. Greenwich Hospital from the banks of the Thames River. In 1677, at the age of 45, and only a couple of years after Faith's death, Wren married again. He married Jane Fitzwilliam, who was the daughter of Lord Fitzwilliam of Lifford. He was probably at least partly prompted by wanting to provide a mother for his young children. It was, however, a short marriage for she died of tuberculosis in 1679 having given birth to two children. After this second tragedy Wren never remarried. Faith gave birth to two children, Gilbert, born in 1672, and Christopher, born in 1675. Gilbert died in infancy in 1674. Christopher was trained by his father to be an architect. It was Christopher that supervised the topping out ceremony of St Paul’s in 1710. He never was a successful architect but died a country gentleman. From his second marriage, Wren had two children. Jane, who was born in 1677, looked after her father when she grew up. She, however, died at the age of 26, before her father. Wren’s youngest son was William, born in 1679; however, he never had any sort of career and was possibly mentally handicapped. After King Charles II’s death in 1685, Wren’s attention was directed mainly to Whitehall. The new king, James II, required a new chapel and also ordered a new gallery, council chamber and a riverside apartment for the Queen. Later, when James II was removed from the throne, Wren took on architectural projects such as Kensington Palace, Hampton Court and Greenwich Hospital, which was his last great work and the only one still in progress after Saint Paul’s had been completed in 1711. The great architect did not live a late life surrounded by flowers and applause. Instead, the criticisms and attacks on his competence and his taste were mounting fiercely. In 1712, the Letter Concerning Design of Anthony Ashley Cooper, third earl of Shaftesbury, circulated in manuscript. Proposing a new British style of architecture, Shaftesbury censured Wren’s cathedral, his taste and his long-standing control of royal works. Although he was appointed to the Fifty New Churches Commission in 1711, he was left only with nominal charge of a broad of works when the surveyorship started in 1715. On 26 April 1718, on the pretext of failing powers, he was dismissed in favor of incompetent William Benson. Wren died on February 25, 1723 at his son’s house after ‘catching a cold’ ; the attribution of this to a winter visit to Saint Paul’s is apocryphal. He was buried in the cathedral crypt, beneath a simple black marble floor slab. An inscribed wall tablet nearby ends with the words "Lector, si monumentum requiris, circumspice" ("Reader, if you seek his monument, look around you"). One of Wren's friends, another great scientist and architect in his time, Robert Hooke said of him: "Since the time of Archimedes there scarce ever met in one man in so great perfection such a mechanical hand and so philosophical mind." This comparison seems a little extravagant. However, there is no doubt that Wren was as deep as he was versatile, at once a man of science and a great artist. As a fellow of All Souls, he constructed a transparent beehive for scientific observation; he began observing the moon, which was subsequent to the invention of micrometers for the telescope. He experimented on terrestrial magnetism and had taken part in medical experiments, performing the first successful injection of a substance into the bloodstream (of a dog). In Gresham College, he did experiments involving determining longitude through magnetic variation and through lunar observation to help with navigation, and helped construct a 35 ft telescope with Sir Paul Neile. Wren also studied and improved the microscope and telescope at this time. He had also been making observations of the planet Saturn from around 1652 with the aim of explaining its appearance. His hypothesis was written up in De corpore saturni but before the work was published, Huygens presented his theory of the rings of Saturn. Immediately Wren recognized this as a better hypothesis than his own and De corpore saturni was never published. In addition, he constructed an exquisitely detailed lunar model and presented it to the king. Also his contribution to mathematics should be noted; in 1658, he found the length of an arc of the cycloid using an exhaustion proof based on dissections to reduce the problem to summing segments of chords of a circle which are in geometric progression. A year into Wren’s appointment as a Savilian Professor in Oxford, the Royal Society is created and Wren becomes an active member. As a Savilian Professor, Wren studied thoroughly in mechanics, especially in elastic collisions and pendulum motions, which he studied extensively. He also directed his far-ranging intelligence to the study of meteorology, and fabricated a "weather-clock" that recorded temperature, humidity, rainfall and barometric pressure, which could be used to predict the weather. In addition, Wren experimented on muscle functionality as well, hypothesizing that the swelling and shrinking of muscles might proceed from a fermentative motion arising from the mixture of two heterogeneous fluids. Although this is incorrect, it is at least founded upon observation and may mark a new outlook on medicine – specialization. Another topic to which Wren contributed was optics. He published a description of an engine to create perspective drawings and he discussed the grinding of conical lenses and mirrors. Out of this work came another of Wren's important mathematical results, namely that the hyperboloid of revolution is a ruled surface. These results were published in 1669. In subsequent years, Wren continues with his work with the Royal Society, however, after the 1680s, his scientific interests seem to have waned: no doubt his architectural and official duties absorbed all his time. Mentioned above are only a few of Wren’s scientific works. He also studied in other areas not mentioned ranging from agriculture, ballistics, water and freezing, to investigating light and refraction only to name a few. Thomas Birch's History of the Royal Society is one of the most important sources of our knowledge not only of the origins of the Society, but also the day to day running of the Society. It is in these records that the majority of Wren’s scientific works are recorded. It is not unusual for the well-educated to take up architecture as a gentlemanly activity, widely accepted in theory as a branch of applied mathematics; this is implicit in the writings of Vitruvius and explicit in such sixteenth-century authors as John Dee and Leonard Digges. When Wren was a student at Oxford, which saw much fine buildings throughout the first half of seventeenth century, he became familiar with Vitruvius' De architectura and absorbed intuitively the fundamentals of the architectural design there. Through the Royal Society and his use of optics, Wren came particularly to the king’s notice. In 1661 he was approached by his cousin Matthew with a royal commission, as ‘one of the best Geometer in Europe’, to direct the refortification of Tangier. Wren excused himself on grounds of health. Although this invitation may have arisen from Charles II’s casual opportunism in matching people to tasks, Wren is believed to be already on the way to architecture practice: before the end of 1661 Wren was unofficially advising the repair of old St Paul’s Cathedral after two decades of neglect and distress; his architectural interests were also evident to his associates at the time. Two years after, he set his only foreign journey to Paris and the Île-de-France, during which he acquired the firsthand study of modern design and construction. By this time, he had mastered and thoroughly understood architecture. Unlike several of his colleagues who took it up as a set of rules and formulas for design, he possessed, understood, and exploited the combination of reason and intuition, experience and imagination. However, Wren might never have been more than the first of a line of Oxford Scholars with architectural interests. The Great Fire of London lit the splendid star in the sky of architecture, and the light of this star illuminated, directly or indirectly, all the architects in England since that time to the Second World War. 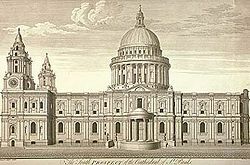 Saint Paul's has always been the touchstone of Wren's reputation. His association with it spans his whole architectural career, including the 36 years between the start of the new building and the declaration by parliament of its completion in 1711. Wren had been involved in repairs of the old cathedral since 1661. In the spring of 1666, he made his first design for a dome for St Paul's. It was accepted in principle on Aug. 27,1666. One week later, however, The Great Fire of London reduced two-thirds of the City to a smoking desert and old St Paul's to a ruin. Wren was most likely at Oxford at the time, but the news, so fantastically relevant to his future, drew him at once to London. Between September 5 and 11 he ascertained the precise area of devastation, worked out a plan for rebuilding the City and submitted it to Charles II. Others also submitted plans. However, no new plans proceeded any further than the paper on which it was drawn. A rebuilding act which provided rebuilding of some essential buildings was passed in 1667. In 1669, the King's Surveyor of Works died and Wren was promptly installed. ‎ It was not until 1670 when the pace of rebuilding started accelerating. A second rebuilding act was passed that year, raising the tax on coal and thus providing a source of funds for rebuilding of churches destroyed within the City of London. Wren presented his initial "First Model" for St Paul's. This plan was accepted, and demolition of the old cathedral began. 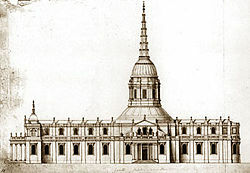 By 1672, however, this design seemed too modest, and Wren met his critics by producing a design of spectacular grandeur. This modified design, called "Great Model," was accepted by the King and the construction started in November, 1673. However, this design failed to satisfy the chapter and clerical opinion generally; moreover, it has an economic drawback. Wren was confined to a 'cathedral form' desired by the clergy. In 1674 he produced the rather meager Classical-Gothic compromise known as the Warrant Design. However, this design, called so from the royal warrant of May 14, 1675 attached to the drawings, is not the design upon which work had begun a few weeks before. The cathedral that Wren started to build bears only a slight resemblance to the Warrant Design. A mature and superbly detailed structure began to rise. In 1697, the first service was held in the cathedral when Wren was 65. There was still, however, no dome. Finally in 1711 the cathedral was declared complete, and Wren was paid half of his salary that, in the misguided hope of accelerating progress, Parliament had withheld for fourteen years since 1697. The cathedral had been built for 36 years under him, and the only disappointment he had about his masterpiece is the dome: against his wishes the commission engaged Thornhill to paint the inner dome in false perspective and finally authorized a balustrade around the proof line. This diluted the hard edge Wren had intended for his cathedral , and elicited the apt parthian comment that 'ladies think nothing well without an edging'. During the 1670s Wren received significant secular commissions which manifest both the maturity and the variety of his architecture and the sensitivity of his response to diverse briefs. Among many of his remarkable designs at this time, the monument commemorating the Great Fire, the Royal Observatory, and the library at Trinity College, Cambridge were the most important ones. The former two of the three works also involved Hooke, but Wren was in control of the final design. By historical accident, all Wren's large-scale secular commissions dated from after 1680s. At the age of fifty his personal development, as was that of English architecture, was ready for a monumental but humane architecture, in which the scales of individual parts relates both to the whole and to the people who used them. The first large project Wren designed, the Chelsea Hospital, does not entirely satisfy the eye in this respect, but met its belief with such distinction and success that even in the twentieth century it fulfils its original function. The reconstruction of the state room at Windsor Castle was notable for the integration of architecture, sculpture, and painting. This commission was in the hand of Hugh May, who died in February, 1684, before the construction finished. Wren assumed his post and finalized the works. Wren did not pursue his work on architectural design as actively as he had before the 1690s, although he still played important roles in a number of royal commissions. 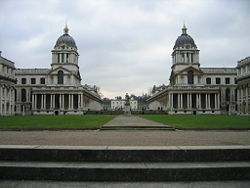 In 1696 he was appointed Surveyor of Greenwich Naval Hospital, and three years later Surveyor of Westminster Abbey. He resigned the former role in 1716 but held the latter until his death. At his death, Wren was 91. He had far outlived the age to which his genius belonged. Even the men he had trained and who owed much of their success to Wren’s original and inspiring leadership were no longer young. Newer generations of architects were beginning to look past Wren’s style. The Baroque school his apprentices had created was already under fire from a new generation that brushed Wren’s reputation aside and looked back beyond him to Inigo Jones. Architects of the eighteenth century could not forget Wren, but they could not forgive some elements in his work they deemed unconventional. The churches left the strongest mark on subsequent architecture. In France, where English architecture rarely made much impression, Saint Paul’s Cathedral’s influence can be seen in the church of Sainte-Geneviève (now the Panthéon); begun in 1757, it rises to a drum and dome similar to Saint Paul’s. Nobody with a dome to build could ignore Wren’s, and there are countless versions of it, from St Isaac’s (1840-1842) in Saint Petersburg to the Capitol at Washington, D.C. (1855-1865). In the twentieth century the potency of the influence of Wren’s work on English architecture was reduced. The last major architect who admitted to being dependent on him was Sir Edwin Lutyens, who died in 1944. With the purposeful elimination of historic influences from international architecture in the early twentieth century, Wren's work gradually stopped being perceived as a mine of examples applicable to contemporary design. ↑ John Ward. The lives of the professors of Gresham College. (NY: Johnson Reprint Corp., 1967). ↑ Bolton and Hendry, eds., The Wren Society. 20 vols. Ward, John. The lives of the professors of Gresham College. NY: Johnson Reprint Corp., 1967. This page was last modified on 20 February 2017, at 17:48.